I’ve thought a great deal about memories – those I have and those I’m possibly making for someone else. My daughter and oldest granddaughter had to take a weeklong trip. The youngest, who was attending summer school, stayed with me. The nine-year-old slept on a mat in the living room of my apartment with her small dog, Toots. We rose at dawn, dressed, walked the dog and drove over to her house where the bus came to take her to school. I dropped off the dog, went to work, came back to collect her and the dog, then drove back to my place for games, TV, more walking the dog and for me – a nap. I had an exhausting week. 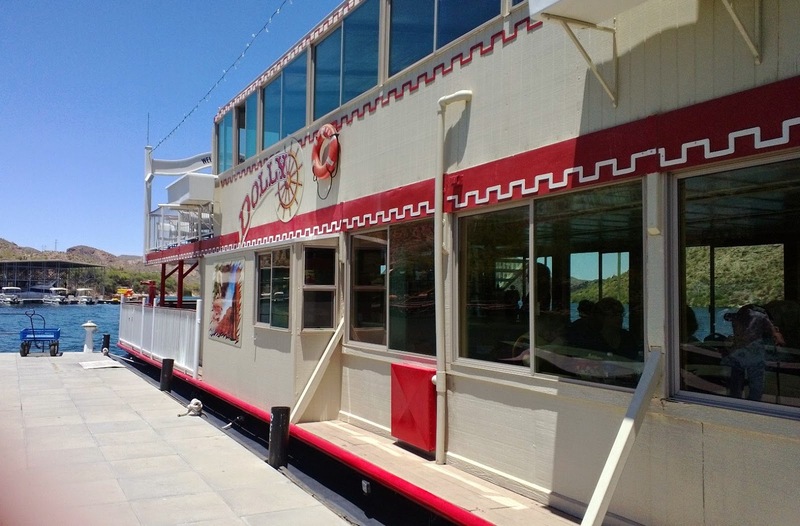 Some of my memories will include a trip to the Dolly Steamboat on Canyon Lake outside of Apache Junction. The lake is created by the Salt River which runs through Arizona, pretty much the main waterway that actually has water until it reaches Tempe Lake. The air-conditioned ride (if you stay on the lower deck) included gorgeous scenery, some wildlife and information about the area from the captain. 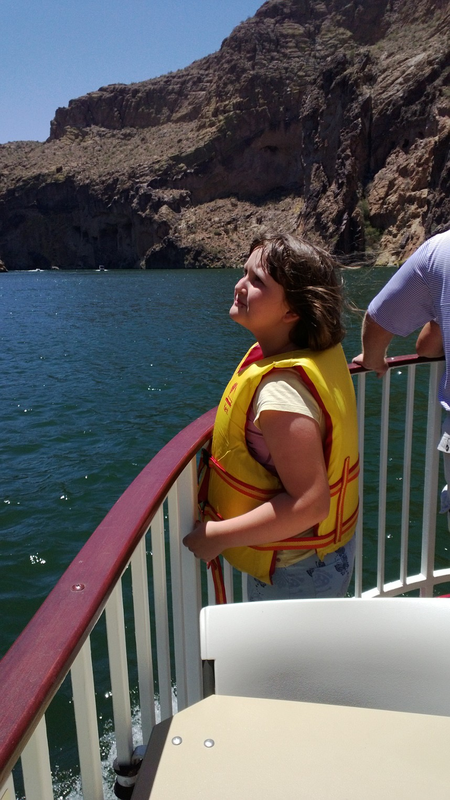 For the first fifteen minutes on the boat, my granddaughter enjoyed none of it. She went into my-life-is-miserable-and-I’m-going-to-eat-some-worms-fit, all because she didn’t like wearing the life preserver all children under twelve must wear while on the boat. Once she got past that and began waving to the people zooming by on water skis, we talked, ate popcorn and had a pleasant time. The next day we looked up the nearest location of How to Train Your Dragons 2. We saw it in 3-D. The last 3-D movie I saw was in my teen years, so this was a totally new experience for me. An excellent show, by the way, and I enjoyed it as much as my granddaughter who had seen the first version and could explain anything I didn’t understand. But one of the most delightful memories had my granddaughter reading a book. She’s had difficulties with reading and summer school was supposed to help her improve. Well, she read through “The Terrible Plop” by Ursula Dubosarsky and Andrew Joyner with such precision I couldn’t believe she hadn’t read it before. Memories. I’ve added several. I hope my granddaughter will remember her times with me as something pleasant when she has her own children and grandchildren. Don't you just hate it when something goes off into cyber space! I love making memories with my granddaughter. She still talks about the time we rode bicycles all over my small Mississippi town. Great post! I blame cyber space for my thinning hair! Every time I have one of these glitches, I start pulling on my hair. What’s worse, I never get any satisfactory answers. If I’m doing something wrong, I’d like to know so I won’t do the same thing again. Thank you for taking the time to re-post this, Marion. It's a touching post . I enjoyed reading it the second time as much as I did the first. It also brought back memories for me as a child with my parents. Thanks for coming back to reread and make a comment. I hope my little three year old grandson remembers his grandmother kindly, and not for the 28 minute temper tantrum he and I experienced together at a park. :) In my fantasies I'd planned on being the cookie-baking, super fun grandma, not a person rolling around on brown Texas grass hanging on to my grandson's vest!!! Thanks for sharing this. HI Marion, I read this on July 1st so was surprised to see it again. But I love it. I've been on the Dolly Steamboat with my mom several times so your post brought back super memories.